If you want to attract this amazing day flying nectaring moth, having the right native food and nectar plants in your yard is the key. This caterpillar was photographed in early June. 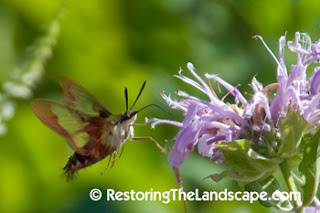 Pictured here is the closely related species, Hummingbird Clearwing Moth (Hemaris thysbe), with its long proboscis unfurling from its coil to nectar on native Bergamot (Monarda fistulosa). 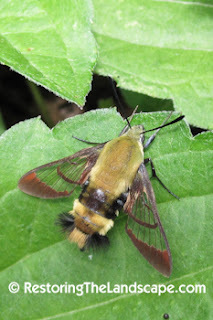 Clearwing moths are fun to watch as they hover like hummingbirds nectaring on flowers. These moths are bee mimics, resembling a bumble bee. 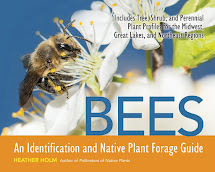 Read an earlier post on bee mimics here.This defensive camouflage makes birds think twice about eating the moth, a real advantage since they're active during the day. 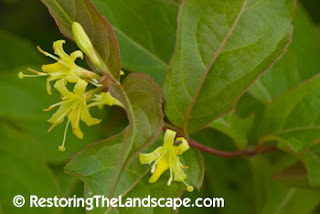 Bush honeysuckle ~ Diervilla lonicera is a great native shrub for medium to dry shade. 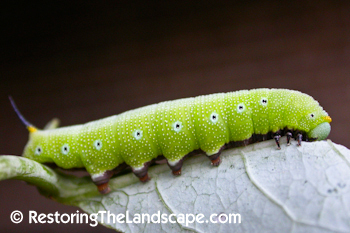 It has a layering habit and in the home landscape works well planted under mature trees. The new leaf growth is burgundy tinged, and the yellow flowers emerge mid June. Snowberry ~ Symphoricarpos albus is a nice native shrub for full sun or partial shade. 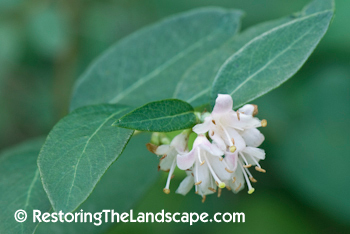 It has a blue green opposite leaves, and small pinkish-white flowers in July that produce small white berries in late fall. It also has a suckering habit, forming thickets and is another good candidate for under trees when there is adequate sunlight. 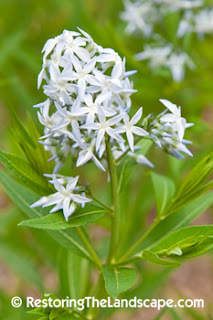 Eastern Bluestar ~ Amsonia tabernaemontana is one of many native Amsonia species that flowers in May, five petaled, light blue flowers. This is a very drought tolerant native for full sun and well drained soils. Note: there are no Amsonia species native to Minnesota. The attractive foliage turns a golden yellow in fall with interesting partially hidden seed pods that unwrap to reveal a rectangular brown seed. 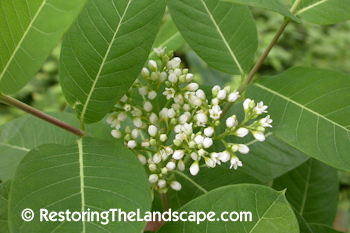 Hemp Dogbane ~ Apocynum cannabinum is one of several native Dogbane species. 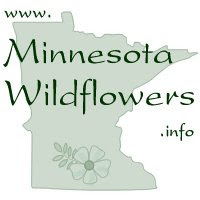 It is often mistaken for Milkweed species because of its milky sap. Dogbane flowers from late June through July. 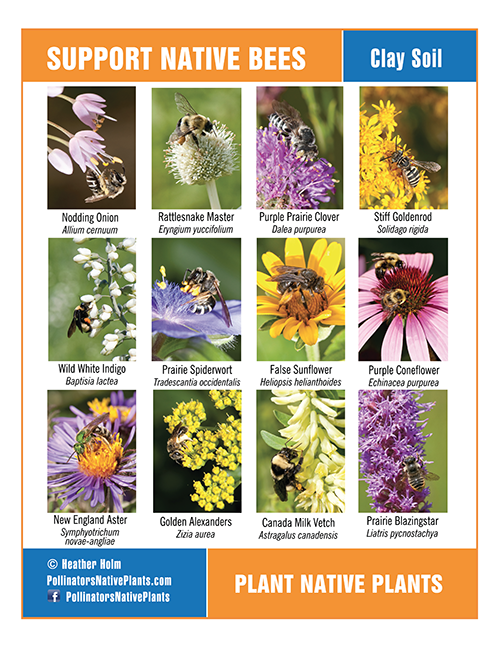 It grows in open, sunny and often disturbed habitats. It is an aggressive native and for that reason is not usually available for sale.